Take a wondrous journey into the life and legacy of animation legend Walt Disney at The Walt Disney Family Museum in San Francisco's Presidio. Learn about Walt's life through exhibits narrated in his own voice, more than 200 video screens, and numerous early drawings, cartoons and films. View classic Disney films in the 'Fantasia'-themed theater, delight in a model of Disneyland, and upgrade to also include admission to the museum's captivating special exhibitions. Don't miss the stunning view of the Golden Gate Bridge and San Francisco Bay through a glass wall in the museum! Awaking Beauty: The Art of Eyvind Earle. On view from May 18, 2017 to January 8, 2018, this original retrospective showcases the life and work of Eyvind Earle. Earle is best known as the lead stylist for Walt Disney’s classic feature Sleeping Beauty(1959) and for concept art that shaped such enduring favorites as Lady and the Tramp (1955) and Peter Pan(1953). 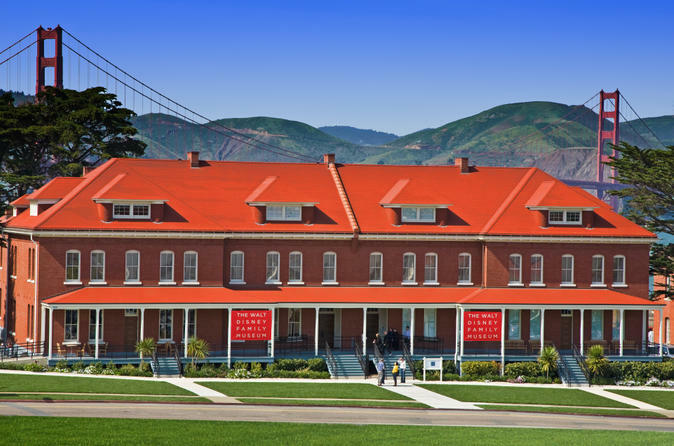 Head to San Francisco's historic Presidio to use your admission ticket to The Walt Disney Family Museum, a fascinating tribute to the tremendous accomplishments of the animation pioneer. Enter the brick building and lose yourself in 40,000 square feet (3,715 square meters) of interactive galleries appealing to kids and adults alike. See early drawings, cartoons, and films created by Walt, and hear about his disappointments and triumphs at listening stations narrated in his own voice. Sit back and watch a Disney classic at the Fantasia-themed theater. Marvel at the staggering collection of awards Walt won, and don't miss the model of the Disneyland as he initially imagined it. Upgrade to also gain access to the Diane Disney Miller Exhibition Hall. Tour this inspiring museum at your own pace, staying as long as you wish during opening hours. Before you leave, make sure to take some gorgeous photos of the Golden Gate Bridge and San Francisco Bay through the museum's wall of glass and from the grounds.